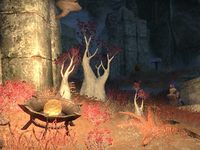 Garlas Malatar, meaning "Cavern of the High Wood" in Ayleidoon, was the westernmost outpost of the Ayleid Empire in the First Era. The city watched over the Abecean Sea, and was known for a brilliant beacon called the Guiding Light that shone above it and was visible from great distances; the Guiding Light was fueled by the light of the Daedric Prince Meridia herself, and was proof of her favor. During the fall of the Ayleid Empire, King Narilmor sealed Garlas Malatar to protect an artifact gifted by Meridia called the Wrathstone, and it has been claimed that the city was ultimately destroyed not by the forces of the Alessian Empire, but by internal conflict or sabotage brought on by Narilmor's increasingly ruthless rule. 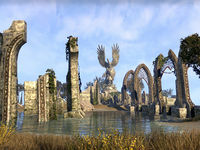 The city's ruins were located on a small island along the Gold Coast of western Cyrodiil, northwest of Anvil, and consisted of a moderate underground complex sometimes known as the Depths of Malatar. In its heyday, Garlas Malatar was ruled by King Narilmor, a zealous adherent of the Daedric Prince Meridia who dedicated his city to her veneration. It was said that Narilmor was one of Meridia's favorites, second only to the great Ayleid sorcerer-king Umaril the Unfeathered. Both the city and its ruler came to be regarded within the Ayleid Empire as the beacons of the west, and Meridia demonstrated her favor by granting Garlas Malatar the Guiding Light, a beacon powered by her light that shone above the city for miles around. Under King Narilmor's reign, Garlas Malatar thrived as a cosmopolitan port city and major trading hub. Its people wanted for nothing and revered their king as a fair and unbiased ruler, even if his penalties for minor infractions of Meridian law were viewed as harsh by outsiders. In the years following the Alessian Slave Rebellion and the fall of the White Gold Tower, as the burgeoning Alessian Empire toppled the remaining Ayleid cities of Cyrodiil one by one, the Ayleids began searching for the legendary Wrathstone tablet, which they hoped would turn the tide of the war. They laid siege to the Dwemer city of Mzulft, which had been rumored to have the Wrathstone in its possession. The Ayleids failed to breach Mzulft or retrieve the artifact; at the time, the Ayleids were unaware that the Dwemer only possessed the left half of the Wrathstone, and that half was stored not at Mzulft, but at nearby Kagrenzel. After this unsuccessful raid, Meridia appeared to her faithful among the Ayleids with a warning that the Ayleid Empire was doomed to fall, and entrusted the right half of the Wrathstone to Garlas Malatar. King Narilmor personally took charge of the artifact's protection. To keep it safe from any outsiders, Narilmor denied both aid and asylum to the desperate refugees from other Ayleid kingdoms and sealed Garlas Malatar. The inhabitants of Garlas Malatar were never heard from again, though some correspondence that managed to escape the city spoke of growing unrest and ruthless suppression of dissent. Some accounts of the subsequent Alessian sacking of Garlas Malatar claim that it collapsed before Men ever set foot in it, implying that it was brought down by internal conflict or sabotage. Long after the fall of Garlas Malatar, the city was uncovered by an Imperial expedition, which erected Fort Mistwatch within the entrance of the ruins and proceeded to plunder the city. The entire cohort was mysteriously never heard from again, however, and the location of Garlas Malatar's entrance was lost for centuries. The fate of the Imperials proved to be a grim one: the expedition had uncovered the right half of the Wrathstone and were forcibly converted into Meridian Purified, becoming immortal yet unwilling defenders of the artifact. By 2E 583, minotaurs were known to congregate around the ruin's exterior. Around that same year, the treasure hunter Tharayya accompanied by Undaunted adventurers uncovered the horrors that had taken place in Garlas Malatar. The expedition fought off hordes of the Meridian Purified who attempted to convert them into the likes of themselves, and Aurorans. They encountered King Narilmor, who had by then had been guarding the Wrathstone for three thousand years and slew him. However, Meridia's blessing allowed Narilmor to transform into a giant Auroran known as the Symphony of Blades, who challenged the adventurers; fortunately, they managed to defeated him and were ultimately successful in retrieving the Wrathstone. In 3E 433, Umaril the Unfeathered returned to Mundus from Oblivion, intent on wiping out worship of the Eight Divines, who were responsible for his original downfall at the hands of the Divine Crusader Pelinal Whitestrake. He reclaimed the ruins of Garlas Malatar to serve as his base, and an army of Aurorans defended it. Umaril made use of a mysterious artifact known as the Dark Orb, a remnant from the time of Narilmor's rule, which protected his inner sanctum and prevented the Aurorans from being banished to the Void as long as they remained in close proximity. Later that year, following the desecration of several of Cyrodiil's Great Chapels at the hands of the Aurorans, the reincarnation of the Divine Crusader led the reformed Knights of the Nine in an attack on Garlas Malatar. The Dark Orb was destroyed, and through the use of the Crusader's Relics, Umaril's physical form was once again slain by the Divine Crusader. With the Blessing of Talos, the Crusader used the power of the Eight and One to follow Umaril's spirit and destroy it, preventing him from retreating to Oblivion and defeating him utterly. The knights retreated from the ruins, which continued to be guarded by the remaining Aurorans who were trapped on Mundus. This page was last modified on 2 April 2019, at 18:48.